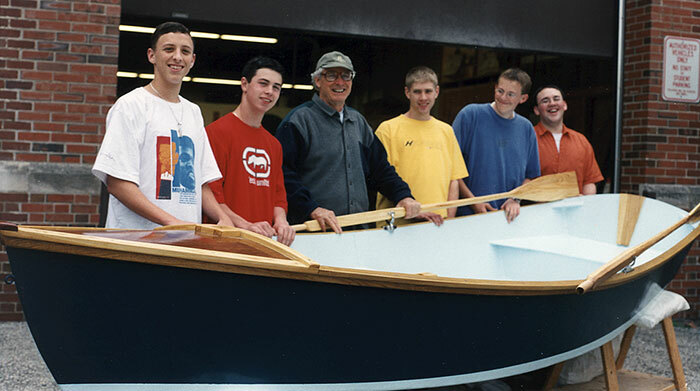 Bruce Porter writes "Bruce Porter built this 13'2" x 50" Jimmy skiff with help from Madison East High School Woodworking Students and staff. Launched May 31st, 2002, the skiff will be used on Madison Wisconsin area lakes and rivers. The skiff was constructed from ACX plywood using ash, butternut, and black cherry for gunwales and trim. The 7-1/2' oars are of ash and oak. The boat plans are from CLC. The oars are from a design given in the book The Adirondack Guide Boat by Kenneth and Helen Durant. Contact Bruce at 3625 Rolling Hill Drive, Middleton, WI 53562."